Computational Biologist Washington Univ. The Genome Analysis and Informatics Technology (GAIT) Center at Washington University School of Medicine in St. Louis is seeking Computational Biologists. ... The GAIT center seeks to hire individuals to analyze DNA sequencing data in collaboration with biologists and physicians [the emphasis is mine]. 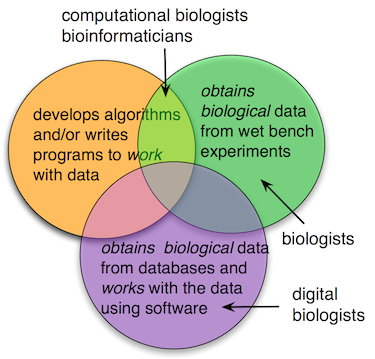 Note - the employer makes a distinction between computational biologists and biologists. He expects the computational biologist to collaborate with biologists. He does not expect the computational biologist to be one. As far as knowledge goes, the candidate most likely has a degree in computer science or engineering. Biologists aren't excluded since biology is listed, too. Last. ...and has taken at least one undergraduate level Genetics class. 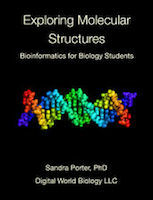 Okay - so all you need to have to be a computational biologist is a computer science degree and one genetics class. Maybe a graph will help Now, for our second show and tell item, I drew a Venn diagram. Fig. 1. The circles in my graph merely show where activities overlap. They are NOT drawn to scale. It occurred to me, from our discussion the other day, that another important difference between digital biologists and regular biologists is the source of the biological data. Biologists are data producers and digital biologists are mostly data consumers. Artificial data, oh my! I'm specifying that biologists, digital and otherwise, work with biological data because computational biologists, statisticians, and bioinformaticists sometimes work with artificial data. I know, if you're a biologist, the idea of artificial data is really weird and a bit suspicious. It certainly surprised me to learn that people made artificial data. But mathematical biologists and statisticians like these sorts of things.They find it helpful to have data sets that really are random, like a random collection of DNA sequences, or a set that follows a Poisson curve, or normal distribution. The most efficient way to get these data sets is to make them. Anyway, unlike mathematical biologists and statisticians, biologists and digital biologists are more likely to use data that come from wet lab experiments. Hey buddy, where'd you get that data? The next factor is "where did the data come from?" I'm well aware that many biologists outsource some of their wet lab data collection to core laboratories. But for the most part, biologists get data from wet lab experiments or from activities where they go out and collect samples. Digital biologists, on the other hand, get most, if not all, of their data from others: either public databases or collaborators. I think the data source is an important difference between us. I often have to explain to school groups, who want to tour Geospiza, that the company doesn't have a lab. Our work environment looks more like the "The Office" with blue cubicles, not a student's vision of a high tech science lab. And this brings me to the last point - why do we need a name at all? Having a name is like wearing a name tag. You don't wear a name tag for yourself, you wear it to help others. Just like we have mathematical biologists, computational biologists, evolutionary biologists, and so on, I think having a name help clarify what makes us different. Digital biologists need a name because there are students and prospective scientists who don't know about this things we do. They don't know that we have all this really interesting data, already out there, in public databases that we can study. They don't know that we can study the data with existing software tools. They don't know that it's important for us to think of the next generation and think how we get them interested in learning how to find data, evaluate data, and use it to understand biology.